Just imagine….access to your Customer’s Active Directory directly in Odin Automation. Estimated at 30% by Meta Group, password change and reset tickets represent a large portion of the calls handled by an IT help desk. Using the IDSync® Cloud Console, it is possible to more efficiently manage this work load and reset locked accounts or change a users’ AD password more quickly from a browser based interface by using your login to the Ingram Marketplace. The information in the IDSync® Cloud Portal is always current and automatically updated with the most recent user information contained in Active Directory, all without any additional maintenance efforts. The IDSync® Cloud Portal is intended for use by MSP’s and other service providers who want to provide additional value for their customers and revenue to their bottom line. For an MSP that uses the IDSync® Cloud Portal, the service provider can now gain access to their customer’s Active Directory through a single and convenient login to Odin Automation that shows all Active Directory users with select meta-data about each user. From within IDSync Cloud Portal you can perform basic enable, disable, and password change activities as well as view meta-data information. Similar to the operation of Active Directory, you make a change by selecting a user, and an action from the context menu. The change is automatically applied in Active Directory, Cloud Portal as well as all connected systems such as Odin Automation, Ingram Marketplace and more — all in real-time. The real benefit of the IDSync® Cloud Portal is to bypass the effort to setup and administer VPN logins for a help desk staff, to each of the separate customer’s Active Directory environments which they support. And then to go through the time and effort to login, finding the credentials and login to the customer’s Active Directory via that VPN, all while the user is on the phone, to make the changes requested by the user. While a VPN approach is used by many it can be slow and clumsy and comes with a fair amount of overhead. 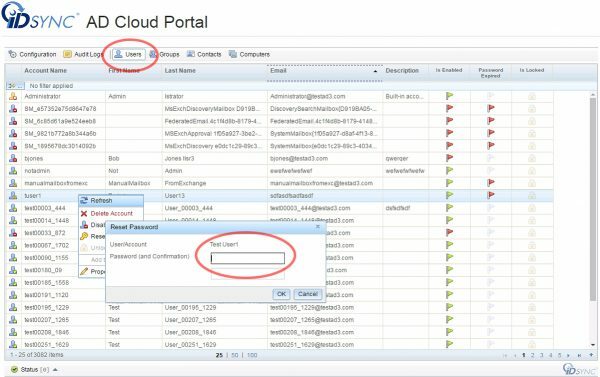 In the case of the IDSync® Cloud Portal by simply making the password change from the Portal, the user’s AD password is reset, and that change is then automatically synchronized to AD and through other IDSync® connectors so that both the Marketplace and other application logins are enabled, satisfying the user quickly and with little effort or lost time, across all their applications with a single change in the Portal.